This tale comes from J. S. Kennard’s short 1901 tome on the colophon — that last page at the end of a manuscript or book. The colophon has served many purposes: giving the title of the work, identifying the scribe or printer, naming the place and date of completion or imprint, thanking and praising the patron, bragging, blaming, apologizing, entreating, praying and much more. Examples can be traced back to clay tablets and forward to websites. Cuneiform tablet from the Library of Ashurbanipal, British Museum. Interesting that the colophon was added in ink after the clay had dried. It’s probably impossible to include every detail of production in a colophon—but some give it their best stab, exhaustively listing everyone that took part in a project. More concise colophons recap only the most relevant details of making—perhaps those the primary creator feels will factor saliently into making meaning of the book. The convention of the colophon in our field exposes an assumption that the meaning of an artwork is informed not only by the finished product, but by the specifics of artistic labor. “Book Artists and Artists Who Make Books“, CBAA, 1 October 2018. Accessed 3 October 2018. If craft does figure in a work’s meaning, then the more we can see how it figures, the greater our ability to appreciate and understand the work. For conveying insight — what materials and from what sources, what processes, what tools, who contributed, where and when the work occurred — the colophon stands ready. But where does it stand? A contemporary of Kennard, A.W. Pollard declared that, to be a proper colophon, it had to appear at the conclusion or summit of the work. Artful as are some of the manuscripts and books that Kennard and Pollard cite, none push the envelope in the manner that works of contemporary book art do. Which brings us to another reason for book artists to consider the colophon: inspiration from history or tradition. The last page of the codex may be a rightful spot for placing the codex, but what if the bookwork’s shape is challenging or musing about the shape of the book? Finishing touches might go anywhere. Think of Van Eyck’s self-portrait hidden in a reflection in The Arnolfini Portrait, or that of Vélazquez in Las Meninas. Historians’ diligent cataloging of the “hands” of the scribes has enriched the self-identifications in colophons and connected those craftspersons with additional manuscripts. Book artists who use calligraphy or involve calligraphers should ponder the implications of this tool historians use to identify scribes by the style of their “hands”. What potential, meaningful “tells” in a work’s colophon might the book artist or calligrapher leave to enrich the work — and provide insights for historians and connoisseurs poring over the finishing touch? The colophon’s underlying value or purpose warrants book artists’ thinking about recording it offline and online, though this might be stretching the definition of the colophon. Our enjoyment of Kitty Maryatt’s 2018 reconstruction of La prose du Transsibérien et de la Petite Jehanne de France (1913) by Blaise Cendrars and Sonia Delaunay is certainly enhanced by the “colophonic” booklet she included with the work and the “About” page online. Perhaps the story of the little “i” left over – the colophon – will prod the future historians of book art to examine bookworks and their artists’ websites for those finishing touches and stir artists to bestow that last finishing touch for the sake of the work’s soul if not their own. The careful reader will notice that the edition number is missing. This instance of the work is one of the binder’s signed but unnumbered copies, having been acquired directly from Daniel E. Kelm. This double-page spread reveals process information about the work that adds to the reader/viewer’s appreciation of the themes and permutations occurring in the pages. The colophon’s nod to Iliazd sends the reader/viewer back to the start of this catalogue that is a bookwork in its own right. A “colophon within a colophon”. The booklet providing details about the original work and Maryatt’s re-creation has an accordion structure and collapses into its own tri-fold wallet, which fits within the cover of the main work, seen here in its acetate holder. This hilarious and touching abecedary parades as a marked work handed in for a course, a portrait of the artist within a contemplation of the past and future of typography and letterpress. This colophon embodies the finishing touch. This colophon continues the premised date with which this work of science fiction book art begins. Bill Hill, “The Magic of Reading”, accessed 20 April 2019. Alfred W. Pollard. An essay on colophons, with specimens and translations. Chicago: Caxton Club, 1905. Alfred W. Pollard. Last words on the history of the title-page, with notes on some colophons and twenty-seven facsimiles of title-pages. London: J.C. Nimmo, 1891. David C. Weber, “Colophon: An Essay on its Derivation,” Book Collector 46 (Autumn 1997). Renée Riese Hubert and Judd D. Hubert’s The Cutting Edge of Reading: Artists’ Books (Granary Books, 1999) is a signal work of appreciation and analysis of book art. Nearly twenty years on, it can be read and appreciated itself more vibrantly with a web browser open alongside it. To facilitate that for others, here follows a linked version of the bibliography in The Cutting Edge of Reading — a “webliography”. Because web links do break, multiple, alternative links per entry and permanent links from libraries, repositories and collections have been used wherever possible. These appear in the captions as well as the text entries. Also included are links to videos relating to the works or the artists. At the end of the webliography, links for finding copies of The Cutting Edge (now out of print) are provided. Barrett, Virginia. Sometimes Feeling Like Eve. San Francisco: VB Press, 1992. Boltanski, Christian. Sachlich. Wien/Munchen: Gina Kehayoff Verlag, 1995. Boni, Paolo; Butor, Michel. La Chronique des asteroïdes. Paris: Jacqueline de Champvalins, 1982. Braunstein, Terry. On Wrinkles. Self-published, 1978. Broaddus, John Eric. Satyricon. Altered book, 1973. Broaddus, John Eric. Space Shot. One-of-a-kind book, n.d. Wellesley College Library, Special Collections. Broaddus, John Eric. Turkestan Chronicle. One-of-a-kind book, n.d. Private collection. Broel, Elisabeth. Aus dem Liederbuch des Mirza Schaffy. Unikatbuch no. 2. Altered book of Bodenstedt’s, 1992. Broodthaers, Marcel. Reading Lorelei. Paris: Yvon Lambert, 1975. Brunner, Helen. Primer of Ritual Elements (Book 1). Washington, D.C.: Offset Works, The Writing Center, Glen Echo, MD, 1992. Chopin, Henri. L’Écriture à L’ENDROIT. Limoges: Sixtus Editions, 1993. Chopin, Henri. Graphèmes en vibrances. Paris: Les Petits Classiques du Grand Pirate, 1990. Chopin, Henri; Zumthor, Paul. Les Riches heures de l’alphabet. Paris: Les Éditions de la Traversiere, 1995. Closky, Claude. De A à Z. Paris: n.p., 1991. Crombie, John; Rimbaud, Arthur. Une illumination. Paris: Kickshaws Press, 1990. Dautricourt, Joelle. Sentences. Paris: Self-published, 1991. Dorny, Bertrand; Butor, Michel. Caractères. Paris: Imprimerie Nationale, 1993. Dorny, Bertrand; Deguy, Michel. Composition 7. Paris: Self-published, 1992. Dorny, Bertrand; Deguy, Michel. Écrire. Self-published, 1992. Dorny, Bertrand; Deguy, Michel. Éléments pour un Narcisse. Paris: Self-published, 1993. Dorny, Bertrand; Deguy, Michel. Le Métronome. Paris: Self-published, 1984. Dorny, Bertrand; Noel, Bernard. Matière de la nuit. Paris: Self-published, 1990. Dorny, Bertrand; Smith, William Jay. The Pyramid of the Louvre. Self-published, 1990. Drucker, Johanna. Narratology. New York: Druckwerk, 1994. Ely, Timothy. Octagon 3. One-of-a-kind book, 1987. Houghton Library, Harvard University. Ely, Timothy. Saturnia. One-of-a-kind book, 1995. Private collection. Ely, Timothy; Kelm, Daniel E. Turning to Face. One-of-a-kind book, 1989. Houghton Library, Harvard University. Epping, Ed. Abstract Refuse: A Heteronymic Primer. New York: Granary Books, 1995. Ernst, Max; Eluard, Paul. Les Malheurs des immortels. Paris: Librairie Six, 1922. Fahrner, Barbara; Cage, John. Nods. New York: Granary Books, 1991. Fahrner, Barbara; Schwitters, Kurt. A Flower Like a Raven. Translations by Jerome Rothenberg. New York: Granary Books, 1996. Finlay, Ian Hamilton. Ocean Stripe Series 3, Wild Hawthorn Press, 1965. Gerz, Jochen. Die Beschreibung des Papieres. Darmstadt: Luchterhand, 1973. Gerz, Jochen. Les Livres de Gandelu. Liège: Yellow Now, 1976. Golden, Alisa. They Ran Out. Berkeley: Nevermind the Press, 1991. Groborne, Robert. Une lecture du Livre des ressemblances [d’] Edmond Jabès. [Xonrupt-Longemer, France]: Æncrages, 1981. Hamady, Walter. Gabberjab 6. Mount Horeb, WI: The Perishable Press Limited, 1988. Hamady Walter. Gabberjab 7. Mount Horeb, WI: The Perishable Press Limited, 1997. King, Susan E. Always a Bridesmaid, Never a Bride. Los Angeles: Paradise Press, 1978. King, Susan E. HomeStead. Los Angeles: The Power of Place, 1990. King, Susan E. I Spent Summer in Paris. Rochester NY: Paradise Press at Visual Studies Workshop Press, 1984. King, Susan E. Salem Witch Trial Memorial. Santa Monica, CA: Paradise Press, 1994. King, Susan E. Treading the Maze. Rochester, NY: Montage 93: International Festival of the Image, 1993. Koch, Peter; McEvilley, Thomas. Diogenes Defictions. Berkeley: Peter Koch, Printers, 1994. Kosuth, Joseph. Two Oxford Reading Rooms. London: Book Works, 1994. Labisse, Félix. Histoire naturelle. Paris: Chavane, 1948. Laxson, Ruth. Wheeling. Atlanta: Nexus Press, 1992. Lehrer, Warren; Bernstein, Dennis. French Fries. Rochester/Purchase: Visual Studies Press, 1984. Ligorano, Reese. The Corona Palimpsest. New York: Granary Books, 1996. Lohr, Helmut. Visual Poetry. Berlin: Galerie Horst Dietrich, 1987. Lovejoy, Margot. The Book of Plagues. Purchase, NY: SUNY Visual Arts Division, 1994. Lown, Rebecca. Procrustes’ Bed. Purchase, NY: Center for Editions, 1990. Lyons, Joan. The Gynecologist. Rochester, NY: Visual Studies Workshop Press, 1989. 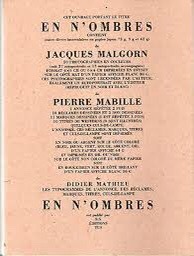 Malgorn, Jacques; Mabille, Pierre. En N’Ombres. Limoges: Sixtus Editions, 1993. Mallarmé, Stéphane. Un coup de dés jamais n’abolira le hasard. Cosmopolis, mai, 417-28, 1897. Manet, Edouard; Mallarmé, Stéphane. L’Après-midi d’un faune. Paris: Derenne, 1876. Martinez, Roberto. Moi Aussi j’aurais peur si je recontrais un ange. 1. La Bataille de Midway. Paris: n.p., 1991. Martinez, Roberto. Moi Aussi j’aurais peur si je recontrais un ange. 2. L’Anatomie d’un ange. Paris: n.p., 1991. Masson, André; Mallarmé, Stéphane. Un coup de dés jamais n’abolira le hasard. Paris: Amateurs du Livre et de l’Estampe Modernes, 1961. Masson, André; Rimbaud, Arthur. Une saison en enfer. Paris: Société de femmes bibliophiles Le Cent Une, 1961. Matta, Sebastian; Jarry, Alfred. Ubu roi. Paris: Atelier Dupont Visat, 1982. Matta, Sebastian. Garganta-tua. Florence: Edizioni della Bejuga, 1981. 2 1/2 x 22 in., 40 pp. Messager, Annette. Mes ouvrages. Arles: Actes Sud, 1989. Nannucci, Maurizio. Art as Social Environment. Amsterdam: Lugo, 1978. Nannucci, Maurizio. Provisoire et définitif. Écarts, 1975. Newell, Peter. Slant Book. New York: Harper Bros., 1910. Osborn, Kevin. Real Lush. Arlington, VA: Bookworks, 1991. Osborn, Kevin. Tropos. Arlington, VA: Osbornbook, 1988. Osborn, Kevin. Wide Open. Arlington, VA: Bookworks, 1984. Penck, A.R. Analysis. Berlin: Edition Klaus Staeck, 1990. Phillips, Tom. A Humument. London: Thames & Hudson, 1980. Polkinhorn, Harry. Summary Dissolution. Port Charlotte, FL: Runaway Spoon Press, 1988. Reese, Harry. Arplines. Isla Vista, CA: Turkey Press, 1988. Rullier, Jean-Jacques. 10 exemples. Limoges: Sixtus Editions, 1994. Sharoff, Shirley; Lu Xun. La Grande Muraille/The Great Wall. Paris: Self-published, 1991. Sicilia, Jose Maria; Lux, Thomas. You Are Alone. Paris: Michael Woolworth, 1992. Sligh, Clarissa. What’s Happening with Momma? Rosendale, NY: Women’s Studio Workshop, 1988. Spector, Buzz. Kafka. 1988. Altered book. Spector, Buzz. Malevich. 1988. Altered book. Spector, Buzz. A Passage. NY: Granary Books, 1994. Spector, Buzz. The Picture of Dorian Gray. 1987. Altered book. Spector, Buzz. Silence. 1989. Altered book. Staritsky, Anna; Albert-Birot, Pierre. La Belle histoire. Veilhes, Tarn: Gaston Puel, 1966. Staritsky, Anna; Butor, Michel. Allumettes pour un bûcher dans la cour de la vieille Sorbonne. Paris: Self-published, 1975. Staritsky, Anna; Guillevic, Eugène. De la prairie. Paris: Jean Petithory, 1970. Staritsky, Anna; Lemaire, Jacques. Le Zotte et la moche. Moulin du Verger de Puymoyen, 1969. Stokes, Telfer; Douglas, Helen. Real Fiction: An Inquiry into the Bookeresque. Rochester, NY: Visual Studies Workshop Press, 1987. Stokes, Telfer; Douglas, Helen. Spin Off. Deuchar Mill, Yarrow, Scotland: Weproductions, 1985. Van Horn, Erica. Scraps of an Aborted Collaboration. Docking, Norfolk: Coracle Press, 1994. Yvert, Fabienne. Transformation. Marseille: Éditions des Petits Livres. 1995. Zelevansky, Paul. The Case for the Burial of Ancestors. New York: Zartscarp, Inc. and Visual Studies Workshop Press, 1981. Zimmermann, Philip. Elektromagnetism. Barrytown, NY: Space Heater Multiples, 1995. Zubeil, Francine. Panique générale. Marseille: Éditions de l’Observatoire, 1993. Zweig, Janet. This Book is Extremely Receptive. Cambridge, MA: Pyramid Atlantic, 1989. It is interesting to contemplate an entangled bank, clothed with many plants of many kinds, with birds singing on the bushes, with various insects flitting about, and with worms crawling through the damp earth, and to reflect that these elaborately constructed forms, so different from each other, and dependent on each other in so complex a manner, have all been produced by laws acting around us…. There is grandeur in this view of life, with its several powers, having been originally breathed into a few forms or into one; and that, whilst this planet has gone cycling on according to the fixed law of gravity, from so simple a beginning endless forms most beautiful and most wonderful have been, and are being, evolved. – On the Origin of Species, 1869, the final paragraph. In disparate “entangled banks” and micro-climates around the world, book artists and Charles Darwin have evolved a symbiotic relationship. By date and place, here are some bookmarks on that evolution. Carol Barton and Diane Shaw organized the exhibition “Science and the Artist’s Book” for the Smithsonian Institution Libraries and the Washington Project for the Arts. Barton and Shaw invited book artists to respond to works in the Heralds of Science collection in the Smithsonian’s Dibner Library. Among twenty-one other pairings, George Gessert was invited to respond to Charles Robert Darwin’s On the Origin of Species by Means of Natural Selection, London, 1859. Gessert’s response was Natural Selection (1994), an artist’s book consisting of computer-printed handwriting and Cibachrome prints of the results of Gessert’s own experiments in hybridizing irises. Citing Darwin’s description of the breeding of pigeons for their ornamental characteristics, Gessert contends “that Darwin also recognized aesthetics as an evolutionary factor”. Since the 1980s, Gessert’s work and writings have focused on the way human aesthetics can affect evolution and the aesthetic, ethical and social implications. His work and that of artists/theorists such as Suzanne Anker, Eduardo Kac, Marta De Menezes, the Harrisons and Sonya Rapoport have constituted the bio art and eco art movements. A collection of his essays appeared as Green Light: Toward an Art of Evolution in the Leonardo Book Series, published by The MIT Press in 2010. Gessert, George, “Hybrid 768,” Science Meets Art, accessed February 8, 2017, http://gamma.library.temple.edu/sciencemeetsart/items/show/37. Inspired by Darwin’s The Descent of Man, Part I, and cell structures in biology texts, Emma Lloyd‘s Evolution Triptych sparks thoughts of fossils, woodcarved altarpieces or the tooled cover of the St Cuthbert Gospel, the code of life embedded in DNA structure and the code of information embedded in the codex. The artistic technique here – carving the book as artifact – is prevalent in book art; see the work of Doug Beube, Brian Dettmer and Guy Laramée, for example. Lloyd’s treatment of the Darwin volume is the only one of its type in this collection of bookmarks. Given the influence of On the Origin of Species, though, it would be unusual if other “book surgeons” have not been similarly inspired by it. To do that, he categorized the 153,535 words in On the Origin – a dot with a 4H pencil for the 50,567 words categorized as “Other”, a 2H pencil for the 38,266 categorized as “Noun”, an HB pencil for the 26,435 categorized as “Verb” and a 4B pencil for the 38,266 categorized as “Adjective”. The result – Darwin, a series of visual “frequency poems” on display at Le Gun Studio in London – is a book altered through the DNA-like pattern of its own words into a completely “other” scroll and into a topographical map of itself – guided by the artist’s hand and mind. In the same sesquicentennial year, in the same city, Stefanie Posavec collaborated with Greg McInerny to issue (En)tangled Word Bank, a series of diagrams, each representing an edition of On the Origin of Species, and the work’s title alluding to Darwin’s “entangled bank” passage presented above. The pressed-dandelion-shaped chapters and subchapters are divided into paragraph ‘leaves’ with wedge-shaped ‘leaflets’ representing their sentences. The sentences forming the ‘leaflets’ of the organism are of orange, senescent tones when they will be deleted in following editions. The green, growth tones are applied to those sentences that have life in the following edition. The tone of each colour is determined by its age, in editions, to that point. Through these differences in colouration the simplicity in structure in the early stages of the organism’s life develops into a complex form, showing when the structures developed to its changing environment. Around the organisms the textual code is provided, showing the changes in the size of the organism, and where the senescence and growth is derived in that code. A series of re-arrangements of the organism focus on changes at each level of organisation. This is “structural infographic” as art. Across the Atlantic, Ben Fry, author of Visualizing Data (O’Reilly, 2007), created a similar work of art called The Preservation of Favoured Traces. Fry color-coded each word of Darwin’s final text by the edition in which it first appeared and used the data to build an interactive display at fathom.com demonstrating the changes at the macro level and word-by-word. Fry went on to produce a poster version and print-on-demand book version. Three thousand miles away that summer, Canadian poets Stephen Collis and Jordan Scott placed multiple copies of On the Origin of Species in various outdoor locations “not … to put the natural into the text, [but] … to put the text out into the natural world and see what happens to it” (p. 2). After a year, Collis and Scott photographed the results in situ and collected and used the some of the still decipherable words as found text for their volume Decomp (Coach House Press, 2013). This blend of the technique of found text and artistic collaboration with nature harks back to Marcel Duchamp’s 1919 Readymade Malheureux , Finlay Taylor’s East Dulwich Dictionary (2007) and M.L. Van Nice’s Feast is in the Belly of the Beholder (2010) among many others. Today many artists still practice the tradition of illumination using medieval and renaissance-era materials and techniques. While many of these have stood the test of time, there are more earth-friendly materials than those used in the past…. The Illuminated Origin of Species will be written on hot-pressed Fabriano Artistico paper made in Italy. It is the best paper in the world for both calligraphy and botanical art. These are extremely smooth, beautiful, and durable papers. They are chlorine-free, acid-free, and 100% cotton. No animal by-products are used in the sizing. Combined with Winsor and Newton watercolors and gouache, this paper will be perfect for the demands of The Illuminated Origin. Houle aims to complete her work in 2019, On the Origin‘s 160th anniversary. Between its hardback covers lined in marbled papers, Angela Thames’ Darwin’s Poetic Words has distilled the often liturgical, poetic passages of On the Origin of Species. Between 2009 and 2013, Thames created four more artist’s books besides Darwin’s Poetic Words, based on excerpts from On the Origin of Species. In this focus and technique, Thames takes and interprets portions rather than the whole of the source as do Houle, Collis and Scott, Fry, McInerny and Posavec, Winston, and Lloyd in their differing ways. Poor Man (2009-13) is the only exhibit in this survey that demonstrates the pop-up technique in book artistry, but as evolutionary biology and fossil-hunting have shown, who knows what undiscovered forms are out there. and “jammed” to produce a series of paintings and preliminary works in ink and watercolor on pages of the book to create ON THE ORIGIN OF SPECIES (after Darwin). Eighteen students, aged 13 to 16, worked with Rollins on the preliminary studies, one of which appears below, that preceded the 2013 exhibition of paintings at the Lehmann Maupin Gallery. The whole book is 360 pages but we don’t ever want to be literal so it’s not all of the pages. They’re there to inspire. It’s like an opera. The libretto inspires the music. You can watch an opera in a language you don’t know, without reading. It’s the same with our work. It’s about a visual correspondence with the text. The work is not about something. That’s why you can’t get hung up on interpretation. That’s a big issue, especially with so much politically engaged art. We want to create a situation, learning machines, so everyone is learning in the process of making and then hopefully the audience will be inspired too. Maybe they will pick up Darwin or continue with the idea. These are catalysts for action. In a video interview with ArtNet, Rollins also refers to the K.O.S. jamming process -reading aloud from the book in a studio setting, discussing it with students and seeking inspiration from the text – not as a school lesson or classroom exercise but as a kind of séance, an assertion that touches the essence of “reverse ekphrasis” in book art. Rather than the literary work or book capturing the spirit of a work of art, the work of art captures the spirit of the book. At the University of Puget Sound (2013) and Center for Book Art in New York (2014), Diane Stemper exhibited her Darwin-inspired book art that explores “the intersection between the natural world, daily living, science and the collective and individual experience of landscape”. Hand bound, printed and produced in her Plat 21 Studio, in Oxford, her Galapagos Map (2013), Darwin’s Atlantic Sea (2014) and Universal Sample (2014), these works have an eerie physical presence. At the Center for Book Art, I have seen and, with the kind permission of Alex Campos, the curator there, touched the works. The intaglio printing and richly textured creamy paper still communicate themselves even across the digital divide. Simon Phillipson completed a variorum edition of On the Origin of Species, in which every verso page is the evolved or amended text and the recto page is the final text from the the Sixth edition. Charles Robert Darwin, On the Origin of Species, variorum edition designed by Simon Phillipson, 2014. The verso pages are completely printed in a special metallic bronze ink. The recto is printed in a combination of black and bronze ink. The bronze highlighted words in the recto correspond to the evolving or amending text in the verso. Very reminiscent of, but distinct from, Ben Fry’s The Preservation of Favoured Traces (see above). Vesna Kittelson is an American-Croatian artist based in Minneapolis. Her résumé cites public collections ranging from Tate Britain and Minnesota Museum of American Art to Cafesjian Center for the Arts in Armenia and the Modern Museum of Art in Croatia. In 2009, she spent time at Churchill College, Cambridge University, where she learned about the life and marriage of Charles Darwin and Emma Wedgwood. Subsequently she created four artist books titled Mrs. Darwin’s Garden depicting primitive-seeming plants imagined as flora that Darwin might have seen from the deck of the Beagle. The names of the plants are made-up Latin names or variations on those of contemporary plants. These abstract images are imagined plants for Mrs. Darwin’s garden. They are illustrations of named floral specimens that never existed in reality. In Mrs. Darwin’s Garden they are presented as if they correspond to data derived from Darwin’s experimentation in his greenhouse. In this book I replaced the 19th C methods of botanical drawing with pouring paints to incorporate the contemporary notion of valuing an accident, followed by drawing with brushes and pencils to gain control and give the images a place and time in the 21st C.
Writing rots, meaning flees. … Yet the book is written to locate (some) meaning here. Would it make any difference to leave Decomp itself in the wilderness? Probably not. Book artist, papermaker and co-founder with her husband David Miller of Byopia Press, Cathryn Miller reviewed Decomp in 2013. If not prompted by Skinner’s preface, Miller must have felt how appropriately evolutionary it would be to attempt to replicate the Decomp experiment by substituting the result of that experiment for the subject of the replicating experiment. Thus, in January 2014, Miller nailed to a tree “a book based on letting brand new copies of On the Origin of Species rot in various locations”. For over twenty months, Miller monitored and husband David photographed the book’s weathering. That, however, was not the transformation that would result in an altered book and possibly a work of book art. Nature had some ironic appropriateness in store for Miller, Skinner, Collis, Scott and all of us. The blown pages were visited by Bald-faced Hornets, who digested them á la John Latham and his students but regurgitated them as cellulose with which to build a large nest. In the context of book art, the nest offers a curiously serendipitous digression. In 1719, the French naturalist René Antoine Ferchault de Réaumur published an essay to the Royal Academy of Sciences on the natural history of wasps. In the passage below, he hypothesizes how their natural papermaking industry could be adopted by man. René Antoine Ferchault de Réaumur, “Histoire des guêpes”, Mémoire de l’Académie royale des sciences avec 7 planches (252) – En 1719, imprimé en 1721. http://www.academie-sciences.fr/pdf/dossiers/Reaumur/Reaumur_publi.htm. Accessed 12 September 2016. In 2015, Miller presented the results as Recomp in her blog at Byopia Press. In September that year, however, critics (raccoons, the artist thinks) visited the work and deconstructed it. Might this prove that, to paraphrase the last paragraph of On the Origin, “by laws acting around us…. from the war of nature, from famine and death, the most exalted object which we are capable of conceiving, namely, the production of the higher animals [and their art], directly follows”? If so, that makes raccoons and critics equal laws of nature. Johannes Heldén’s work Field is book, visual art and installation all in one. Heldén’s is perhaps the darkest variant on Darwin’s theme here. – as the ”code” of todays species is slowly lost, so is the code and context of language. The gaps in the text correspond to the shift in the DNA sequence, prose turns into dark poetry, connections and meaning changing for each iteration. Since Darwin’s theory encompassed extinction, perhaps Heldén’s vision is not so much a variant on Darwin as it is a pessimistic appreciation and warning about the impact of our interaction with the entangled bank. Cathryn Miller’s “bio-book-art” and that of Collis and Scott stand at the collaboration end of the bio art spectrum, where the artist yields considerable control to nature in the creative process. At the coordination end of the spectrum – closer to domestication of species – stands Dr. Simon F. Park’s bio-book-art – The Origin of Species – perhaps “the first book to be grown and produced using just bacteria”. Presented at the Edinburgh International Science Festival, the small book has pages made of bacterial cellulose, produced by the bacterium Gluconoacetobacter xylinus (GXCELL). Its cover is even printed with naturally pigmented bacteria. Although Park’s science-driven process for paper manufacturing and printing echoes the speculations of French naturalist René Antoine Ferchault de Réaumur (see above), it seems to have much in common with the painstaking craft of handmade paper and hand letterpress printing. The first sheet of Park’s micro-organically grown paper took a little under two weeks to be generated and stencilled with his bacterial ink. It seems chronologically backwards to move from bio-book-art’s live media to Chris Ruston’s ammonites of The Great Gathering. As should be evident by now, however, the evolution of the symbiotic relationship between book artists and Darwin has been anything but a straight line. It has curved, circled and recursed. Tim Rollins + K.O.S may have had their séance 30-50 feet away from Darwin’s lodgings in Edinburgh, but Chris Ruston brought her Darwin-inspired book art to an even more fitting venue: a church converted into Colchester’s Natural History Museum. The Great Gathering refers to our continued exploration of where we have come from, and where we are going. Combined the seven volumes tell an amazing story spanning 650 million years. Sculptural in form, each book reflects a moment of this journey. From black holes and dark beginnings, through ocean and sediment layers, Darwin’s On the Origin of Species, and recycled National Geographic magazines the work charts the inevitability of change. They are a response to visiting Museum collections, in particular the Natural History Museum, Colchester and the Sedgwick Museum of Earth Sciences Cambridge. Fossils hold the key which have enabled us to unlock the story of our Origins – from the largest creatures to the smallest organisms. The 19th century saw an explosion of knowledge and understanding, culminating in Darwin’s publication of On the Origin of Species. By piecing together the riddle of the fossil record, Darwin and his contemporaries began asking revolutionary and challenging questions, the results of which are still felt today. and how our reflection in the mirror in Volume VII under the maker’s tools and the made thing ought to implicate us — the viewer here and now – in an ongoing process of making and remaking. If you have come this far with these bookmarks on the evolution of book artists’ symbiosis with Darwin, note that today and every 12th of February is Darwin Day, marking international celebrations of the birth of Charles Darwin and his contributions to science. From today’s engagements and all those to come with the concepts of On the Origin of Species and (I hope) with these bookmarks, perhaps new discoveries and new creations of book art will emerge. Henry James, The Beast in the Jungle, 1903. Allen Press, 1963. The copy shown is one of only 15 copies with an extra suite of 16 artist’s proofs, each titled, numbered 9/15 and signed by the artist in a separate portfolio. 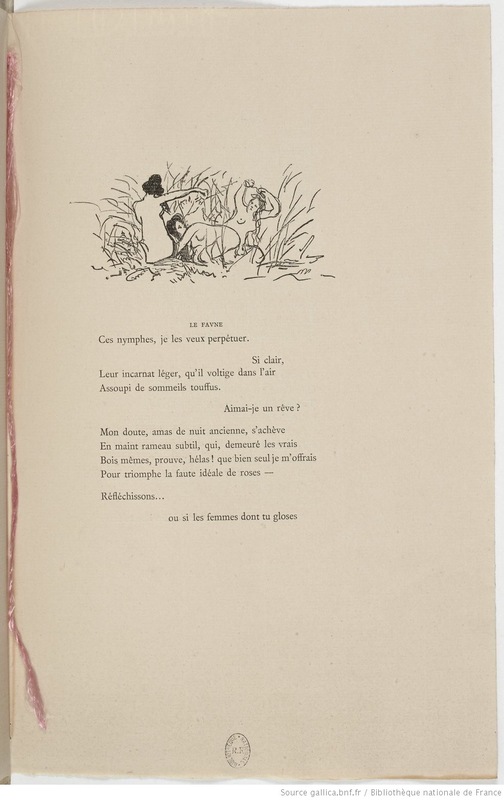 Displayed online at Sophie Schneideman – Rare Books and Prints. In his Books and Vines essays, Chris T. Adamson provides fresh, personal and insightful comments on fine book productions and their content such as Henry James’ “The Beast in the Jungle” from the Lewis and Dorothy Allen Press in 1963, pictured above. An oenophile, as the title of his series suggests, Adamson also occasionally offers tips on the best wines with which to decant and read these works. James is a favorite author at Books On Books as is Herman Melville. Indulge the punning coincidence of Adamson’s introducing us to Wilber Schilling’s Indulgence Press and his edition of Melville’s “Bartleby the Scrivener: A Story of Wall Street“. Schilling’s edition of “Bartleby” – with Suzanne Moore’s original hand lettering of Bartleby’s classic statement “I would prefer not to” first appearing fully legible then becoming larger until it literally falls off the bottom of the final page – was an early career statement of an interest in more than fine press work but in book art as well. Herman Melville, Bartleby the Scrivener: A Tale of Wall Street, 1853. Indulgence Press, 1995. Consider Schilling’s Half-Life/Full-Life and its binding a variation on the accordion/flag structure of Hedi Kyle and Claire Van Vliet. The complexity of the form marries well with that of the intertwining, interleaving text and photos along the timelines of the Doomsday Clock and global warming. Schilling’s photography in Half Life/Full Life speaks to the importance of that craft in his overall portfolio. His photos of aging, decayed and unbound books are haunting and remind me of the found art of M.L Van Nice. Schilling has collaborated with Thomas Rose (visual artist and professor at the University of Minnesota), Michael Dennis Browne (poet and librettist), Rick Moody (author of The Ice Storm) and Patricia Hampl (MacArthur Fellow poet and novelist). He has collaborated with Daniel E. Kelm (book artist, founder of the Garage Annex School for Book Arts and a collaborator with Suzanne Moore). Given the influence of Marcel Duchamp and Joseph Cornell on works such as Arthur & Barbara (Arthur Danto and Barbara Westman) or Surplus Value Books: Catalog Number 13, you might say that Schilling has attempted to collaborate with them as well. The danger in that, of course, is highly derivative artwork. That early-career whiff of genius in commissioning the now famous calligrapher Suzanne Moore to hand letter “I would prefer not to” and spreading it in ever larger size across the pages might be what takes Schilling’s work beyond the derivative. His work is worth examining with that anticipation.